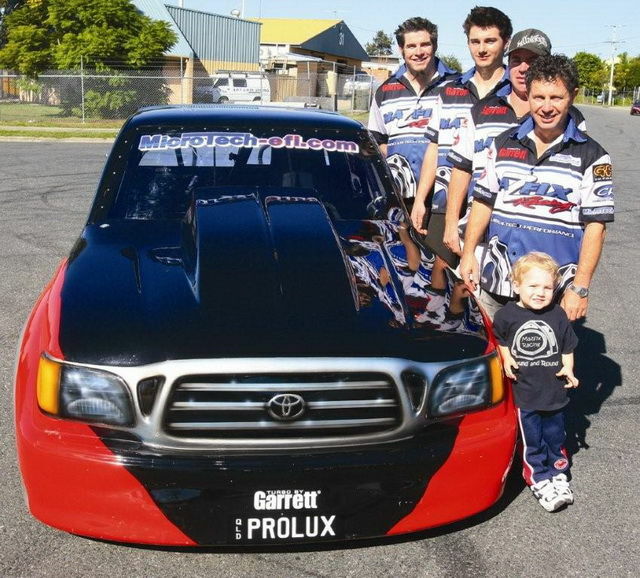 Back in 2006 Archie Kajewski, owner and proprietor of Mazfix, had a massive 180mph crash at the WSID Compak Attak in his Pro Turbo 20B powered Beretta. So bad was the accident he was lucky to walk away with only minor injuries. Prior to this Archie had set the world of Compacts on fire, being the first rotary in the world to run 200mph and the first Australian Rotary and Sport Compact car to run a six second pass. With many plans and future development ideas simmering, unfortunately Archie had to step out of the Pro Turbo ranks, due to the Beretta being a write off, but he was not totally out of the game. 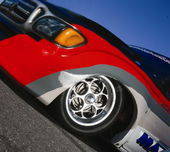 He decided to turn his street Mazda Rx7 Series 6 into an un-tubbed 13B monster just so he could still have some track time. And that he did, presently it is still one of the fastest in the country but his need for the Pro Turbo ranks is now taking priority forcing the black series 6 up for sale as a roller** (contact Mazfix for details 07 3341 1111). With the data from the Beretta still at the workshop and the latest technology that has been learnt through the performance gained in the un-tubbed game, Archie is busting to throw his hat back in the ring. This is where the second partner in the mission to be back at the top of the Pro Turbo ranks comes into play. 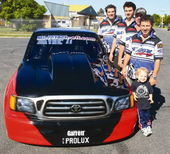 Welcome Craig Melbourne, from Australia, aka RX3ROTOR. Now like I mentioned earlier, Mazfix have the knowledge and experience to run at the top of the field, especially now when they have a proven chassis on board. 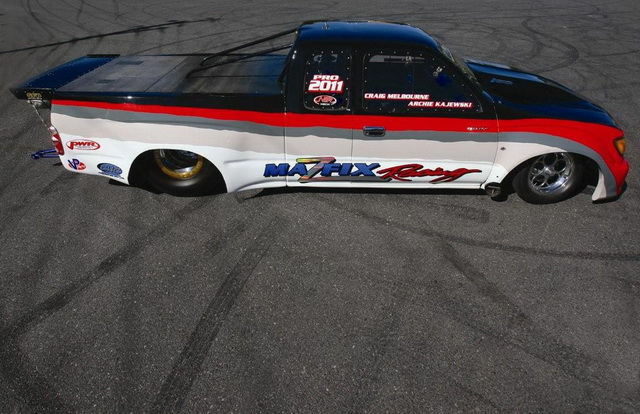 Craig noticed the ex Craig Paisley NHRA 2003 Toyota Tacuma Pro Stock Truck for sale on Racing Junk USA and his mind started to think about Archie’s predicament. After much talk and deliberation they set out a major plan of attack. You could not build a Pro car for the price that Craig purchased it for so he quickly jumped on a plane to New York to make the sale stick and he loaded the car into a container heading for OZ. 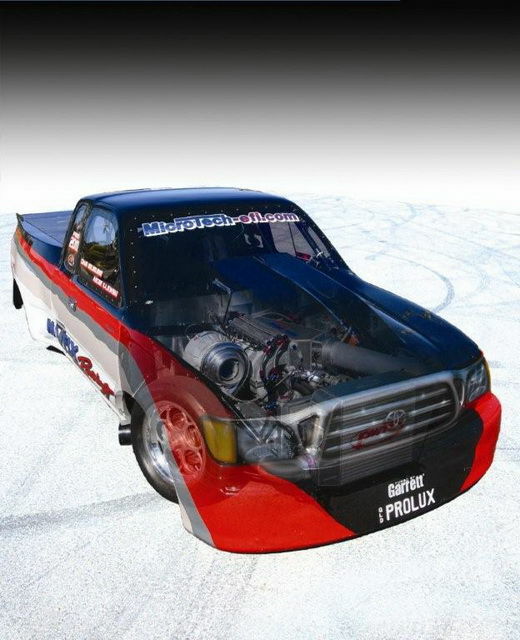 Craig owns the rolling chassis and Mazfix own the running gear, with Archie leasing the truck and is set to drive it for the next 3 years. Then Craig has the opportunity to purchase the running gear once the car is fully sorted and set up. 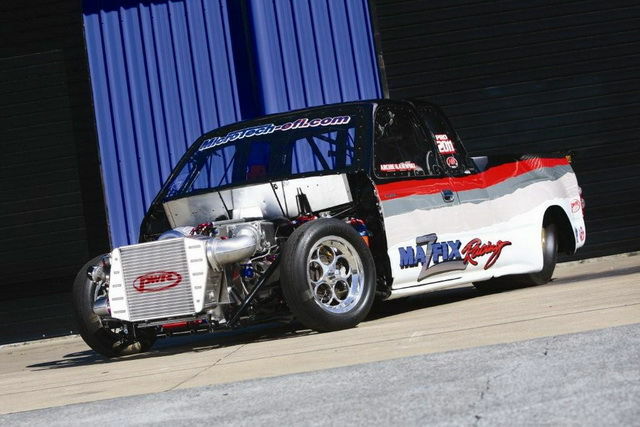 Chassis…The truck’s chassis is a Jerry Bickle 2003 Pro Truck Chassis Kit that was constructed by C&F Race Cars USA. 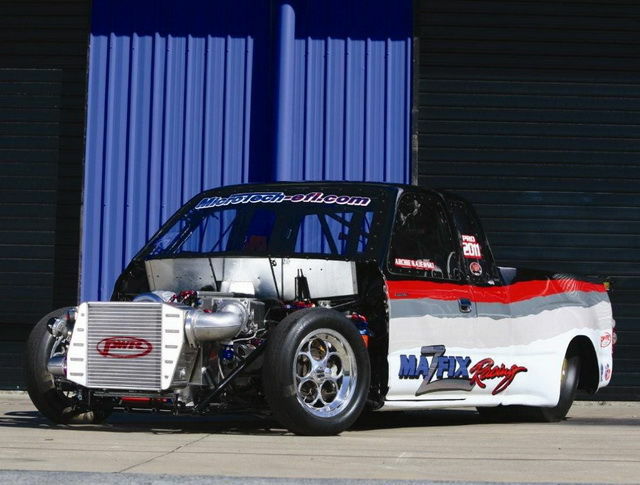 The tuff truck is an EX-NHRA USA Toyota Racing Development (TRD) Sponsored 2JZ race car that was driven by Craig Paisley to a best time of 6.95@203mph with the 2JZ combination. As you can tell by the photos the truck is not short on wheel base, try 128” for size. 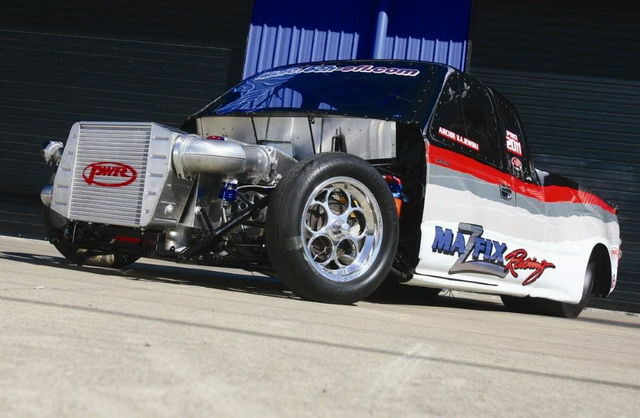 They say size doesn’t matter, but in drag racing, the longer the chassis the more stable the ride. 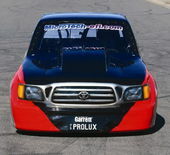 To put it into perspective, a Pro Stock car chassis is generally 108” in length so “PROLUX” should handle like a dream. Toyota built and painted the car in USA Toyota custom colours for Craig Paisley, the same paint job as you see today, who raced it for three seasons in the NHRA Sport Compact Powerade Series. 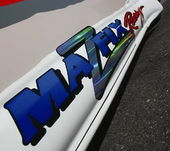 Craig and Mazfix have the plans of doing a full custom paint job in the future but their main game is to get the car out on the track as soon as possible. The rear end has had a revamp since the purchase with a Mark Williams diff centre, 40 spline Strange gun drilled axles and a full floating rear end, all to comply with ANDRA specifications. These days there are a few different choices when it comes to a transmission that can handle over 1600hp, but the boys decided to go with the Liberty Extreme 5 Speed Clutchless. 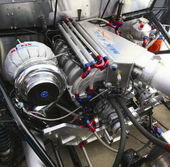 The Extreme is the best that Liberty makes to handle the massive horsepower that the Mazfix 20B will be producing. A twin plate Ray Franks slipper clutch has the tough job of transferring the power at the right time. 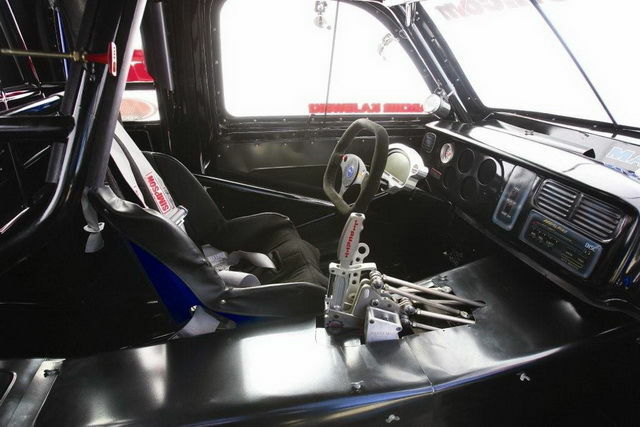 Most Pro Turbo race teams have realised the importance of an adjustable clutch and what it can do to help with chassis balance to make the power come on with greater control. The engine….Back in the Beretta days, Archie’s development of the Mazda 20B was unfortunately cut short but now the door has reopened allowing him to experiment once more. 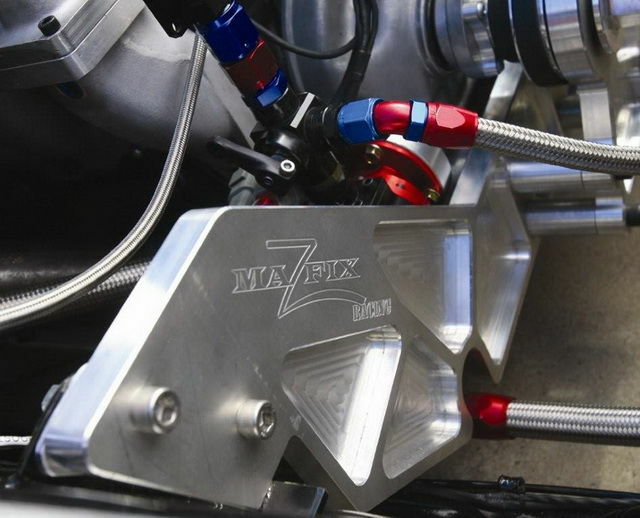 The new race engine has the Mazfix Spec Turbo Bridge Port that he is very excited in trying out in a full blown race car. The amount of custom one off billet pieces including engine, gearbox, alternator mounts and even a billet Motec dash mount is something special. 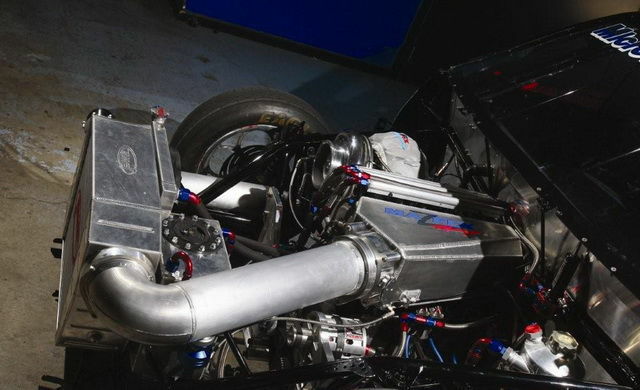 A custom Mazfix exhaust manifold hangs off the side of the 20B and a monster custom Garrett/Mazfix single turbo that is regulated by twin GFB 50mm wastegates. The gates are plumbed into a massive 6” dump pipe off the Garrett turbo, so keep an eye on the start line for the fireworks as the GFB gates open on the 2 step. The engine will start off on 25psi for licensing and testing that flows up and through one of the biggest intercoolers you will find. 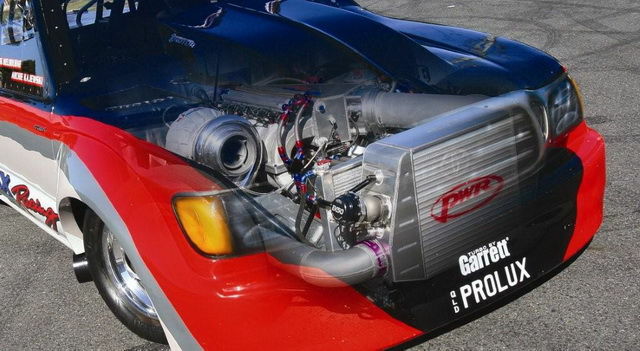 In fact, PWR Performance products who made the cooler to Mazfix specs believe that it will flow all the horsepower that Archie can throw at it. It also has the ability to be boxed in allowing water/ice to cool it further if required. The tapered plenum is a style that Archie has tried and tested previously and the alloy manifold is mounted to the inlet ports. The methanol race fuel is delivered via a mechanical pump mounted off the front engine plate up to an amazing 15 x 2000cc EFI injectors and whatever the thirsty 20B doesn’t use is returned back through an Aeromotive Fuel Pressure regulator. The brains behind the engine, controlling everything, is the Motec M800 that has the ability to be incredibly precise with multiple data outlets which makes tuning more accurate at a high end level. With the rotary engine, spark is a very important part of keeping the engine together so a Motec CDI gives the extra spark and control when required. All this on paper sounds like it has all you will need to run the numbers on the dyno and on the track. 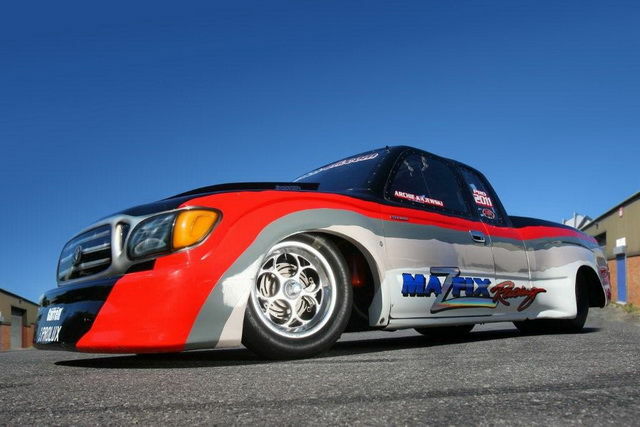 As mentioned earlier the initial runs will have minimal boost until the truck and driver are comfortable to handle the extra power that the Mazfix race 20B will have. By the time this issue hits the newsstands team Mazfix should have had the truck out testing and tuning with the Jamboree only a few months away. The Jamboree at Willowbank will be the debut event, so it is worth your while to take some time out to have a look at this unique combination in the flesh for all to see. I must thank Archie and Mazfix for allowing SCDRM to get up close and personal with this wild machine. If looks have anything to do with it PROLUX will no doubt be at the pointy end of the field. **This has since been sold.